You are here: Home / Great Deals / Nostalgia Electrics Quesadilla Maker Just $16.47! Down From $30! 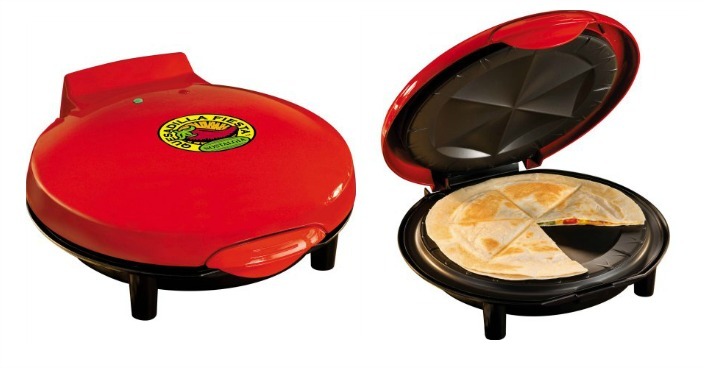 Nostalgia Electrics Quesadilla Maker Just $16.47! Down From $30! Right now you can get this Nostalgia Electrics Quesadilla Maker for just $16.47 (Reg. $30)at Walmart! The Nostalgia Electrics EQM200 8-Inch Electric Quesadilla Maker creates a uniquely fun food experience. Delight in quickly creating crispy, delicious quesadillas using a variety of meats, cheeses and vegetables – even peanut butter or Nutella for sweet varieties. The unique plate design creates easy-to-cut sections that seal in flavorful ingredients, making each slice perfect. The non-stick coating makes cooking easy and clean-up a snap. The removable drip-tray keeps excess oil away to make food healthy. A Ready Light notifies when the quesadilla maker is done preheating and the cook time is only 3 to 7 minutes, depending on the type and amount of fillings. The unit design allows the product to stand on end, making storage simple.d.